Welcome to the TGV's and AGV theme page! A newer TGV Page with the very latest information exists, so why not follow this link there? Created for 4rail.net by John McKey. Pictures by Pekka Siiskonen, Ilkka Siissalo, Sanna Siissalo, John McKey and Miroslav Broz. Super High Speed News provides you the newest happenings and trends in the super fast railroading. A TGV and AGV Theme Page provides information on these most succesfull super high speed trains. See the Velaro & ICE 1,2,3 Page for these Siemens prides! The Virgin Trains Pendolino class 390 is one of the many pendolinos found on the 4rail.net Pendolino page. It all started from Japan in 1964 with the first bullet train. See what the latest Shinkansens have to offer for the world! The Eurostars use the Channel Tunnel connect the U.K. to the mainland Europe. The Chinese CHR program is the most advanced in the world and China will be the world leader in super high speed trains usage in just a few years. One of the always popular trains is the Russian super high speed test train Sokol. While Sokol was a product in the wrong time period, the Russia today has an impressive high speed program starting. Maglev of Germany and China starts the new generation of floating on the rail, the new comfort level of travelling! Below the existing over 650 TGV units are sorted in the order of appearance. Click any types picture to see more information or the larger version of the picture! Most of the subjects have a lot of extra information available. Like in most other countries, the French super high speed revolution was a result of decades of persistent work choosing between the alternatives and above all trying to find the needed monetary resources for the chosen technology. Among other alternatives for the Train � Grande Vitesse, even the gas turbine prototype under "TGV-001" was tested. This approach was however quickly found as uneconomical in the post oil cirisis (1973) world, so the current energy source electricity was chosen. Most other modules remained original, including the looks of the first TGV units, aerodynamic slightly airplane style designed by Jack Cooper. The very first production type of the Alstom TGVs and the train that started the infamous TGV saga we know today. Originally the 92 units were painted bright orange / blue / red livery and were only painted current SNCF super high speed gray and blue around year 2000 when the units were refurbished. Most of the units will again be refurbished and rebuilt for another 15 years in daily service. Usage: All around France, multicurrent models also in international journeys to Switzerland and Italy. La Poste was early in maximizing the speed of its services in the 1980s with 7 half TGV sets adapted to super high speed freight transport. The second generation of the TGV trains, TGV Atlantique, was designed shortly after the excellent experiences on the operations of the TGV-PSE's were available. The original operating area for these improved super high speed trains was the French new LGV Atlantique line between Paris, Le Mans and 2 short branches (south west of Paris) finished in 1989-1990. Usage: Mainly lines Southwest of Paris France. Eurostars are close relatives to the TGVs. While the building consortium was wider, the basic solutions ended up being very similar to the TGVs. The most important difference seem to be that while the TGVs typically have only 8 or 10 trailers, the Eurostar (double/operational) unit has 18 or 14 trailers. Reliability of the Eurostar unit is also lower than that of the TGV (93-96% vs. 99%). Usage: General purpose super high speed train, the capital units are used especially for Channel Tunnel traffic. TGV R�seau is the other second generation train set type. Externally similar to the Atlantique sets, the R�seaus have 8 intermediate trailers instead of the 10 on Atlantique. This makes R�seau sets "standard" TGV-length, 200 meters from one end to another, and allow the double set to use the French standard 400 meter platform length effectively. The R�seau units were also slightly improved from the Atlantique type by adding the seals against the pressure variations (just like airplanes, or newer locomotives). Electrical systems: All 25kV 50Hz and 1500V DC, 40 units also 3000V DC, with either Belgian or Italian cab signalling. Usage: General purpose national and international type commonly seen on lines. Thalys is a separate company co-owned by the SNCF (62%), Belgian SNCB (10%) and Deutsche Bahn (10%). Thalys owns 9 units of similar to TGV R�seau. The units are used to connect Brussels with Paris, K�ln in Germany and Dutch capital Amsterdam. Even Marseille has been added to the destination chart. with ATB (Dutch) cab signalling. Usage: international type commonly seen on lines norrth of Paris, occasionally elsewhere too. TGV Duplex is both the first 3rd generation TGV as well as the first double decked TGV type. The double decked construction was achieved without adding weight of the trailers! TGV Duplex generation units with single story trailers were also manufactured for Thalys to supplement the capacity of ten Thalys PBA (R�seau like units). These units are used mainly on the international traffic north of Paris. TGV-Dasye follows in the foot steps of the highly successfull TGV-Duplex. The locomotives of these 700-series TGVs have asynchronous (AC) traction and European standard trains control. Usage: Same as on Duplexes, ETCS2 allows for wider European use like the Benelux and elsewhere electrical systems allowing. TGV Hybrid or TGV R�seau-Duplex is an interesting design of second generation locomotives and fourth generation coaches. In early 2000s traffic boomed and added capacity was needed FAST, resulting in switching trailers between the 19 Duplex trainsets and 19 R�seau sets. The result on a hybrid side is a very Duplex-like trainset with a broad blue band effectively disguising the forms of the R�seau locomotives at both ends. Electrical systems: All 25kV 50Hz and 1500V DC, with TVM430 cab signalling (for use in France). Usage: General purpose national type for higher capacity lines. The unit 4530 of the TGV R�seau fleet was transformed into a moving super high speed lab in 2006. While moving with the flow of traffic, the trains state of art insturuments detect any wear, tear and other infra based risks. Also, its a base and super high speed moving hotel for its staff! Usage: Metering in the whole of France's railnetworks. In 2007 a special TGV-V150 unit was built to hunt for the "conventional" trains world record. This new record of 574,8 km/h (357 mph) was achieved on April 3rd 2007 on French LGV-Est after several months of preparations and fine tuning. The V150 was built like a sportscar, every detail was tuned compared with the normal super high speed trains. The locomotives for the TGV-150 were later used for the PGV-POS units running between Paris France and the cities of Germany. The new fast TGV units connecting Paris with the "East", Eastern France and Germany are called TGV POS. These feature the new asynchronous power cars and trailers taken from the previous TGV R�seau units. Two of the power cars were also used for the TGV-V150. The newest development of the TGV focuses primarily on the international traffic. 30 units will equipped for destinatrions in Germany, Switzerland and Luxembourg, while another 25 units will be built for use in France only. These trains are evolution units of the TGV-Dasye. Cab signalling: ? ERTMS, plus TVM-430 ? Usage: Mainly France to German destinations. - 35 more new TGV units will be delivered to SNCF starting year 2011. There is also an option for 65 more units. - TGVs for export markets are also probable, as well as customers outside SNCF (the French National Railways). So far the great majority of the TGV trains have been delivered to SNCF and its parnetships: Thalys, Eurostar, Lyria. The current orders and rebuilding of the older units plus plans for the freight TGVs prove that there is still life cycle of the TGV type trains and through evolutionary steps like double decking, added power, possible distibuted power (in addition to the locomotives), higher operations speeds of up to 340 km/h (211 mph) and other innovations will keep the current fleet and the future trains in operation for several decades into future. The TGV R�seau has had some export market success, here the train type in slightly on the nose altered version as Spanish Railways Renfe class 100. Units built: 20, 200? - 200? Unit numbers: 01 - 15 - ?? Usage: Mainly Madrid - Sevilla. Another TGV R�seau export success story is the KTX1 trainset. The numbers of the cars, 18 or 14 seems to resemble those of the Eurostar cousin. Will be added here if the deal materializes. Although the TGV has been very big successfull in France, the export success has been relatively limited. Even the companies that bought the TGV changed to either competing solutions or their own national designs for the following train types. This does not mean that trains would be poor, but that the competition might be offering better general terms than the French. The TGV-PSEs units 96 and 17 here seen at Gare du Nord in Paris France behind their newer cousing Thalys PBKA unit 4306. Picture by Sanna Siissalo 2008. A great view to the structure of the articulated TGV trailers on this TGV Lyria's (TGV's for traffic between Switzerland and France) TGV-PSE unit number 47 at Bellegarde France. Notice the faded "TGV 25 Ans " (years) logo on the nose of the train. In France the super high speed period has lasted already for well over a quarter of a century! Picture by Ilkka Siissalo 2007. TGV-PSE at the Paris Gare de Lyon in 2002. TGV-PSE unit 95 at Paris Gare dy Nord in summer 2009. Picture by Robert Forsstrom. An SNCF TGV-PSE double unit in it's original colors somewhere in France. The 109 built TGV-PSE (Paris-Sud-Est = Paris to South East) units were the very first production type of the Alstom TGVs. They were also the train that started the infamous TGV saga we know today. The 92 units of the initial order were originally painted bright orange / blue / red livery and were only painted to current SNCF super high speed gray and blue around year 2000 when the units were refurbished. Most of these units will soon again be refurbished and rebuilt for another 15 years in daily service. The TGV-PSE truly is a proof of concept that these trains are both durable and safe! Picture: An orange-blue-white colored double TGC-PSE unit on line in 1987. Picture by Pekka Siiskonen 1987. The first generation TGV-trains were first used for super high speed traffic from 1981 between Paris and Lyon in France. While the super high speed line was built between these two major French cities, the trains routes radiated much further. The travel time between Paris and Lyon was slashed from 6 hours to 2 hours so all the routes that could use TGV and this first high speed line benefited from the novelty. Nowadays the TGV-PSE units can be found most anywhere on the French networks and some Swiss destinations. Running the TGV-PSE in Switzerland: The swiss 15kV 16,66 Hz AC system can't provide enough power for the 1st generation TGV's electrical system to run at their maximum speed and thus the speed is reduced to around 200 km/h. As a careful observer, you may notice that this means the French older 1500V DC system is insufficiet for higher speeds needs as well. However, the 1500V in France is only used around bigger cities and traditional lines with no capability to super high speed (>275 km/h) operations. All the super high speed LGV's (Lignes � Grande Vitesse) are equipped with the newer 25kV 50-60 Hz AC. After decades of intense research many technical details were still conservative on these production vehicles. I.e. traditional DC traction motors were used and the suspension system for passenger trailers was originally provided with !springs! instead of the later used pressurized air. Tried and traditional was also the choise to use locomotive at both ends of thew train instead of the Shinkansen style power distribution. Partly this was probabaly made on safety concerns, the TGV's have proven to be the safest high speed trains. While the heavy locomotives plow anything away from the rails if necessary, the articulated articulated trailers structure prevent the train from zigzagigging which would always be fatal to the passengers. The trains have served well and were the needed important first step for the success of the TGV type trains. The TGV-PSE units were rebuilt around year 2000 and repainted to the current SNCF blue-silver-gray high speed colours. Rebuilding also meant upgrading the speed to the 300 km/h / 186 mph (from the original 270 km/h / 168 mph) for most units after the TVM430 train control system was added. Being a great success as the production super high speed train almost all of the TGV-PSE's are still in their original revenue earning use around France and Switzerland. -> operations area: Around the high speed and traditional networks inside France and the tricurrent versions also in Switzerland, some used for journeys to Italy as well. -> Mass, metric tons: bicurrent 385 t / 418 t gross, tricurrent 390 t / ? > more boxy look than on the Reseau/Atlantique models otherwise quite similar. > Above the driver roof and the body of the locomotive there is an easily noticeable step. This can not be found otherwise at first look similar TGV-A. > The first bogies of the coaches are powered (unlike in the following evolution versions). -> TGV-PSE Unit 46 hit a truck with the huge concrete mixer stuck on the level crossing near the Swiss border late 2007. The train speed just before the accident was fortunately just 100 km/h (65 mph). Although the truck driver was killed (as the truck was torn apart), the engineer and some passengers were 'just' injured in a huge collision. The TGV unit 46 suffered major damage on its forward locomotive and the whole unit derailed. As with previous derailments, the TGV safety features prevented any major accident from happening (the train stayed aligned in spite of derailment and the locomotives collision structure protected the engineer). At first it was thought that SNCF could borrow the locomotive from La Poste's vacant half unit to get the unit running again, but later it was reported that the unit 46 was towed very slowly for repairs or storage. One of the alternatives is that this would be the first cargo TGV-unit or the third La Poste unit, as it is unsure whether repairs will cost so much (TGV-PSE's are at the end of their lifecycle with just 10-15 years remaining in active duty) that it would be wiser to order new TGV-Dasy, AGV or similar unit instead. March 2009 SNCF unweiled plans to repair this unit too as a part of the TGV-PSE rebuilding program. -> TGV-PSE Unit 60 was involved in the accident in Dijon at the end of year 2006. -> TGV-PSE Unit 88 was used for TGV-Atlantique testing and later renumbered as TGV-PSE Unit 118 (so the number 88 is missing from the roster). -> TGV-PSE Unit 99 newer existed! -> TGV-PSE unit 101 was for years (from 1997 to 2000) used as a test lab for the tilting technology as a TGV P-01. After the extensive tests were completed in the middle of the year 2000 the unit 101 was returned back to normal service without the tilting capacity. Tilting tests were started with Fiat Ferroviaria tilting mechanics but later replaced by (the French said more robust, advanced and cheaper) Alstoms own tilting technology. Interestingly this technology is said also to be used in the most recent Pendolino units. Alstom also acquired Fiat Ferroviaria years ago so some of the issues might be solved that way now. The tested tilting technology was most likely used first time on the Amtrak Acela tilting TGV like units in the Northeastern U.S.A. from 2004. -> TGV-PSE Units 112 and 114 are in Swiss SBB/CFF ownership since 1993 and 2005 as a part of TGV-Lyria fleet. -> The SNCF unweiled plans in march 2009 to rebuild the complete line of 107 TGV-PSEs to match todays needs. No details on the program are published so far, but the price is estimated to be 150 million euros. SNCF expects the original TGV manufacturer Alstom, German super high speed manufacturer Siemens AG and the large international railroad rolling stock manufacturer Bombardier among 2 others to take part in the competition for the deal. It would be easy to imagine that all the 214 locomotives, 1391 bogies, all the obsolidated technology to be replaced or completely rebuilt while preserving the structure of the locomotives and trailers where possible. Top speed might be incresed to 320 km/h ofr higher to match that of the newer TGV units. The reason for the rebuilding program most likely is need for additional units (seems to be permanent state for SNCF due to strong demand of super high speed services) and the attractive price tag compared with the new unit acquisition. -> La Poste (the French National Postal Services) has 2,5 TGV-PSE units for its express mail services. These units have not been cleared for 300km/h operations like the all the SNCF TGV-PSEs were after the refurbishing. Maximum speed for TGV La Poste is 270 km/h, still quite sufficient for the parcel and freight operations and suitable for beating the airlines in the distances of under 1000 kilometers! -> All SNCF TGV-PSE's were refurbished around the year 2000. The infamous orange-white-blue livery was painted silver-gray-blue and interiors of the trailers were upgraded. Also some standardization on the seating scemes were made. The maximum speed was raised from 270 km/h to 300 km/h matching that of the newer Atlantique and R�seau units and the standard minimum speed for the French super high speed lines, the LGVs. -> It's probable that the future of the TGV-PSE units is in the "quieter" routes and new markets to give room to more spacious double decked TGV-Duplex, TGV-Hybrid and TGV-Dasy units. Or some of the unit might be adapted to fast freight use if the market for that is found "interesting". The TGV Manufacturer Alstom has had plans for the super fast freight units for decades. -> The TGV units (mostly TGV-PSE) trafficing to Switzerland from France are called with the brand name "TGV Lyria". The TGV Lyria stop in Switzerland at: Basel, Zurich, Sargans, Landquart, Chur, Pontarlier, Neuchatel, Bern, Vallorbe, Lausanne, Montreaux, Aigle, Martigny, Sion, Siders, Leuk, Visp, Brig and Geneva (end 2008 information from TGV Lyria). Some of the Lyria TGV units are owned by the Swiss SBB/CFF. ...and the snail logo turned around! One of the over hundred unit herd of the TGV-PSEs. The newer meets the old, the age of the original TGV design shows well in this picture. The TGV Duplex on the left unit number 208 and a TGV-PSE on the right. TGV-PSE in its original attractive orange-blue-white livery. Picture in Lyon France by Pekka Siiskonen 1983. A pair of TGV-PSE units dashing on the LGV high speed line between Paris and Lyon in 1987. Picture by Pekka Siiskonen. The panning of the camera shows an interesting view on the automatic couplers of the orange colored TGV-PSE units. Picture by Pekka Siiskonen. Inside the second class of the brand new TGV-PSE trailer. Looks quite aschetic compared to todays interiors. Picture by Pekka Siiskonen 1983. The TGV-PSE unit 117, here seen in Zurich Switzerland is built with trivoltage electricity systems (25kV 50-60 Hz AC + 1500V DC + 15kV 16,66 Hz AC) to enable it to reach both France and Switzerland. In Europe there is no such thing as a common electrical system although for the newer implementions of the 25kV 50 Hz AC seems to be highly popular. Picture by Ilkka Siissalo. In the picture on the left the TGV Paris Sud-Est unit 95 seen at Gare du Nord in Summer 2009. Notice the newer reddish SNCF logo on the locomotive nose. Picture by Robert Forsstrom. TGV La Poste, the postal services owned parcel TGV, seen here over the fieds in the rural area. This is the unit 956/957 converted from the TGV-PSE unit 38 so it does not show the splittable 2 half sets, but an all articulated trailers. The normal freight route is from Paris to Mac�n and Cavaillon. Picture by mecdepaname7575 under Creative Commons. This kind of cargo super high speed train has been studied several times by the big high speed players SNCF, DB and others in Europe. The trains could transport more efficiently and just as fast at the core Central Europe any goods, that are time sensitive, like parcels, vegetables and other perishables. On this kind of train it would take just one day to get frest tomatoes and lettice from Spanish sun to the Scandinavian winter! -> Train control: TVM 300, ?TVM430? TGV-Atlantique set number 354. Externally similar to TGV-R�seau sets, Atlantiques have 10 trailers instead of the usual 8. An SNCF TGV-Atlantique double set near Bordeaux in France. Notice the beautiful catenary poles typical to some areas in the Southern France. Occasionally, you can even find birds nesting at the top of the poles, what a proof that the railroads are interesting! The second generation of the TGV trains, TGV Atlantique, was designed shortly after the excellent experiences on the operations of the TGV-PSEs were available. The original operating area for these improved super high speed trains was and still mostly is the French new LGV Atlantique line between Paris, Le Mans and 2 short branches (south west of Paris) finished in 1989-1990. The design is more aerodynamical than its predecessor, suspension was provided with air (SR 10 suspension) and traction motor type was now 3 phase AC (alternating current) synchronous to provide more power and reduce time spent in the maintenance. The power to the track to move the train was now delivered by the locomotives only (TGV-PSE has two powered trailer cars) totalling 8800kW (2x4400kW) and the number of trailers was increased from the traditional 8 to 10 since the original operations area was "relatively flat" unlike the first line LGV Sud-Est between Paris and Lyon which has 3,5% gradients! Operational speed ot the TGV Atlantique was now higher 300 km/h (186 mph) from the beginning. The paint was redesigned as well and was for the first time the famous silver and blue TGV style that we know today. The two first units wore for a test period Shinkansen like white-blue paint. * Silvery gray with blue band (similar older Thalys models are painted red and gray). * More aerodynamic round forehead than on the TGV-PSE. * Where the TGV R�seaus have 8 intermediate trailers, the TGV Atlantique has 10. -> The TGV Atlantique sets have been in the internal trailer renovation program since 2006 after almost 20 years of revenue use. -> Units 301 and 302 were originally painted white-gray-blue instead of the then new silver-gray-blue high speed colors (very much like the Shinkansen trains), but probably due to difficulty on keeping the white trains outside clean the color was changed to less demanding silver. -> Unit 390 had extremely bright tricolor/EU flag colored vinyls on it in 2009 celebrating "Tous �co-mobiles"
-> Trailer 1 has the accessible space for wheel chair plus a larger bathroom. -> Trailer 10 has a compartment for 17 children. Future or the future other types of TGV's will be added to the home lines of the TGV-A's as the traffic grows. Most likely candidates are the TGV-Dasye's and TGV-reseaus. -> LGV-Atlantique (the high speed line for TGV-Atlantique) was announced by president of France Francois Mitterand on September 22 1981. This started the huge planning and construction work. The curve radius minimum was set to 4000 meters and the climbs to maximum on 0,25%. Unlike most high speed lines in France, the LGV-Atlantique starts right at the heart of Paris next to Montparnasse station. This was enabled by tunneling the Paris center. -> LGV-Atlantique (France LN 2) was opened on 20th September 1989 from Paris to Tours/Le Mans (south west) and the branch towards Bretagne. One year later the other branch from Le Mans towards Tour and Bordeaux was taken into use. The total length for the line is 277 kilometers (172 mph). The SNCF TGV-Res�au set 552 in Paris right next to its competitor the Deutsche Bahn ICE3. Picture by Sanna Siissalo 2008. A picture of the TGV-R en route to Paris at Nissan station in rural France. Notice the 8 intermediate articulated trailers instead of 10 in the TGV-Atlantique type. Picture by Focalplane 2010. Another great picture of the streamlined TGV-R�seau on it's route near Nissan, France. Below the tricurrent unit 4529 in the same place on the summer day. Pictures by Focalplane 2010. Thalys PBA (TGV Res�au series) unit number 4531 (the first Thalys delivered) behind sports the attractive red and silver sceme of the trainset between Paris, Belgium, Luxembourg and parts of Germany. Thalys is a joint venture of the national railroad passenger operators north of Paris. All the Thalys PBA units have been refurbished and come out with a stylish new looks. The reddish color schemes outside and inside are preserved. In the front the Thalys PBKA, which has a TGV Duplex like locomotives coupled to single story trailers. Picture by John McKey 2004. TGV R�seau is the other second generation train set type. Externally similar to the Atlantique sets, the R�seaus have 8 intermediate trailers instead of the 10 on Atlantique. This makes R�seau sets "standard" TGV-length, 200 meters from one end to another, and allow the double set to use the French standard 400 meter platform length effectively. The R�seau units were also slightly improved from the Atlantique type by adding the seals against the pressure variations (just like airplanes, or newer locomotives). The SNCF ordered 100 of the R�seaus as universal train sets to complement both TGV-PSEs and TGV-Atlantiques. With new lines opening and more and more passengers than ever before boarding the TGVs, extra capacity was needed. Later 10 of the initial order were converted to Atlantique sets. Another 10 units of the type were delivered to Thalys in 1996 to be used for high speed traffic between France, Belgium, The Netherlands, Luxembourg and Germany. The initial line the Reseau units were used was north of Paris to Lille and beyond. Soon the use of units operation was expanded to very long distance Lille - Nice serivce with stops at Lyon and Marseille. The use included soon also trains to the southwest and after the opening of the LGV-Est (line east of Paris towards German border, opened in 2007) also running on this line. Currently the TGV R�seau is a "Unifrancais" type found on just about any line. In 2007 19 sets were converted to have double decked duplex trailers for added capacity and the R�seau trailers were installed to TGV-POS units where the initial demand did not require use of double decked units. The TGV-R�seau Duplex locomotives are easily duistinguished from others with their (full)duplex like coloring. seats and one extra seat is for the handicapped in the car R1. 10, so you need to do some counting. -> operational speed was raised from 300 km/h (186 mph) to 320 km/h (199 mph) in 2007 to enable running fast on LGV-Est as well. -> Unit 502 was involved in an accident in Bergeues France in 1997, which led to the withdrawal of it. The power car 28004 was destroyed and trailers 7 and 8 damaged. other trailers were used to fix the Thalys PBKA set 4342. -> Unit 531 set the new endurance record for super high speed trains in 2001 running non stop from Calais Fr�thun to Marseille France. The distance is 1067 kiLometers, which the train managed to run in 3,5 hours with an average speed of 305 km/h! Here the northers lines use TGV R�seau sets number 508 and 509 coupled together at their terminal Gare du Nord. Picture by John McKey 2004. Thalys PBA number 4536, a 'disquised' trivoltage TGV-R�seau set is stopping tounoboard passengers in the night of the Brussels Midi. Picture by Ilkka Siissalo. The infra management TGV Iris 320 unit at Gare du Nord station in Paris, France. Imagine a railroad track inspection lab so advanced, it could inspect the rails at full speed of 320 km/h (199 mph) while running among the same speed production units. Well, this high tec lab exists! TGV Iris inspects the rails of the French high speed lines. One of the kind in the whole world it shows what the French product development is capable of on it's home turf although the French are poor salesmen when it comes to the exports. The unit 4530 of the TGV R�seau fleet was transformed into a moving super high speed lab in 2006. While moving with the flow of traffic, the trains state of art instruments detect any wear, tear and other infra based risks. Also, its a base and super high speed moving hotel for its staff! quarters for the crew of 7 technicians and 2 engineers. -> Distinctive color sceme of several tones of red and gray. With the above IRIS 320 is capable of inspecting around 200'000 kilometers of line per year! The TGV-Hybrid / TGV Res�au Duplex unit 619 is dashing through the green French landscape near Nissan oppidum in the southern France. Notice how well the older generation locomotive and new Duplex trailers fit together! Picture by Focalplane. The SNCF TGV-Hybrid / Res�au Duplex set 608 passing Orange station in France. The color sceme is strikingly different between the two TGV R�seau locomotives above and higher above, so there these can't be mixed. However, the new Hybrid unit is at quick look quite similar to the TGV Duplex units the color obscuring the distinctive shape of the locomotives. SNCF TGV Unit 619 in the curve showing well the train formation. Picture by Focalplane. TGV-Hybrid is a TGV unit with the TGV-R�seau locomotives with the new TGV-Duplex type double decked coaches. 38 R�seau locomotives were converted in year 2007 to 2008 along with 19 new "Duplex-type" double decked coaching. While the train has an easily distinguishable R�seau locomotive at both ends, these are disguised by the very Duplex like painting efectively hiding the forms of the locomotives. The origin of the conversion to the hybrids was in the difficult capacity situation due to strong demand for the SNCF services in the years 2006-7. The operator had a shortage of capacity on the most trafficked lines and on the other hand fast 320 km/h (199mph) capacity was needed for the LGV-Est. To help in both needs the SNCF decided to swap the coaches of both train types: New TGV-POS engines were coupled with the old R�seau trailers and R�seau locomotives got brand new double decked coaches. Why to swap the coaches: The 320 km/h (199 mph) TGV-POS units are used in the area, where the traffic volumes don't yet demand the usage of the double decked units (traffic has not yet saturated the capacity of the track or stations) and higher than normal speed is needed. On the other hand the enhanced TGV-Hybrid units have added passenger capacity for the crowded lines south of Paris. Where the added strength of the newest TGV locomotives is needed for the operational speed of max 320 km/h (199 mph) on the LGV Est, the TGV-Hybrids with their R�seau locomotives are well suited for the conventional 300 km/h (186 mph) French high speed networks. -> Pointed R�seau locomotives and doubled decked rounder coaches. -> Silvery gray with broad blue painting (original R�seaus have narrower stripe) along the sides (occasionally some units might have adverticement vinyls to cover more or less of the train exterior). Late night at Gare du Nord in Paris, TGV Duplex unit number 232 has just arrived and is unboarding before being servuiced for the next dash south from Paris. The infamous TGV-Duplex unit 235 in Paris Gare de Lyon in 2002. This TGV unit is the one many model railroaders recognize. Picture by John McKey. The third generation of the TGV trains, the Duplex was developed to add extra capacity with double decked coaching on the lines. The added capacity waas and still is important on the lines south of Paris, which will be saturated by traffic in the near future. The saturation mainly concerns the original PSE line (LGV Paris-Sud Est). The Duplex has a new power car design, double decked coaches and numerous smaller improvements to the earlier technologies. The Duplex is easily distinguishable from the older TGV's by it's locomotives streamlined design and double decked coaches. The number of double decked units is ever increasing with tens of more unit in order for the SNCF. The newest locomotives for TGV-POS have very similar design, but look different due to their "updated" paint scemes (to accommodate these with the Res�au trailers). * SNCF: Painted silver and blue, with a white stripe. rounder than on the older versions. * Just one flat windshield. * the coaching is double decked (the TGV-POS's are at first sight quite similar, only obvious difference being the single story coaches). The TGV-Duplex units are painted the same way as the Dasye's and look externally at first glance the same. The easiest way to tell the difference is to look at the unit numbers: 200 series for Duplex and 700 series for Dasye. Picture of this Duplex by John McKey 2002. The name TGV-"Dasy"/TGV-"Daisy" stands for the "Duplex Asynchronous". Now top of the line, the double decked TGV's newer and slightly more powerful TGV-Dasy units are one by one rolling out of the assembly line at Alstom for the French National Railways SNCF. As asynchronous traction motors require less maintenance and are designed to be more powerful on the higher speed than their DC counterparts, the order for this evolutionary model a logical move from the SNCF. Less maintenance translates to greater return for the investment for the owner. Unlike AGV's TGV-Dasy units use the tried traditional TGV design, which has proved to be both reliable and safe with millions of kilometers travelled since its introduction in the early 1980's. Double decked Dasyes are mainly intended to add capacity to those lines, which are already crowded. This will postpone the needed infrastructure investments along for example between Paris and Lyon (with ever increasing traffic amounts there will be a need to build another high speed line between these two cities within a decade). The units operate in pool with TGV Duplex units and share the same service facilities. -> It is hard to make difference between Dasy's and Duplexes, the unit numbers are the best recognition guide, 700 series for Dasye. -> Painted silver and blue, with a white stripe. -> Just one flat windshield. -> the coaching is double decked (the TGV-POS's are at first sight quite similar, only obvious difference being the single story coaches). The TGV-V150 275 unit was on display in Paris by the river Seine after it's successful new record. Below the same unit being floated on the bvarge on Seine, Paris, France. From time to time the world speed record for the EMUs (electric multiple units) is renewed, the latest event being in 2007. The Alstom built TGV-V150 created the new world record of 574,8 km/h (356,7 mph) on April 3rd 2007. The French have been very active on the record braking front with their TGV units, sometimes the record braking events happening as a duel with the Germans but most of the time just braking the previous record created by the TGV. Although the record braking is usually made with a TGV that is part of the production fleet of the SNCF (the French Railways), the units are specially equipped for the record braking events. The TGV-V150 train consisted of 2 TGV-POS locomotives, and 3 TGV-Duplex type trailers, all of which were slightly altered for the event. For the locomotives the other pantograph was removed and several panels installed to minimize the air friction. Wheels were larger than normally and the overhead electrical power supply of 25kV was raised to 31 kV as well as the wires to provide it were doubled. Under each car were permanent magnet motors later used as a part of the Alstom AGV EMUs. These provided added power. Normally the trailers are unpowered on TGV units with few exceptions (TGV-PSE, Eurostar) and the locomotives at each end of the train provide all the power needed. The TGV-V150 unit run for several weeks on the then new LGV-ESt (East of Paris high speed line) before the new record event. On April 3rd the train was crowded with the press members and the Alstom technical personnel. The TGV-POS units are painted the same way as the other earlier single story TGVs. However the rmore rounded engines are an easy way to distinguish from other older units. Picture by Sanna Siissalo. TGV-POS units in between their assignments at Gare de l'Est in Paris of units 4413 and 4416. Picture by Robert Forsstrom 2009. A rare exception to the TGV-POS fleet, the unit 4406 is owned by SBB and seen here at Basel main station between the assignments. Picture by Ilkka Siissalo. The name TGV-POS is derived for this new low passenger volume route TGVs initial destinations: Paris to East of France and German South in German language, Paris-Ostfrankreich-S�ddeutschland. In 2007 when these units were put together there was a severe lack of high speed free capacity for the operator SNCF. The lack of capacity lead to conversion of 19 TGV-Res�au units to double decked units with new Duplex-coaching. This also vacated 19 single story Res�au style coaches, which were supplied with brand new powerful locomotives for both ends. 19 TGV-POS unit were born. TGV-POSes operate mostly form the Paris Gare de L'est, the eastern station and are currently pooled with higher volume TGV-Dasye units for the routes in the same direction. and Switzerland (latter as part of TGV-Lyria fleet). -> Rounder locomotives that would otherwise be used on the single story TGV units (similar to TGV- Duplex, TGV-Dasye and TGV-2N2). -> Narrower blue stripe than would aotherwise appear on new engines. 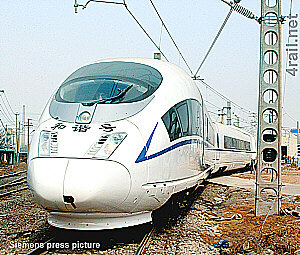 -> The Power cars of set 4402 created the new world record for high speed trains of 574,8 km/h on April 3rd 2007. The record formation was called "V150". -> Unit 4406 is owned by the Swiss SBB/CFF and replaces some of the older TGV-PSE units used earlier. If the previous train set was named TGV Duplex with the double decked coaching, this Thalys PBKA train with similar locomotives and simple traditional single story trailers could maybe be named "TGV Simplex"? Picture above of Thalys PBKA number 4343 by Sanna Siissalo and Picture below of Thalys PBKA number 4307 by John Mckey. Both Pictures at Paris Gare du Nord. Thalys PBKA: 1996 - 1998. * Thalys: Painted all red. Thalys text with a bird figure. * The engine is streamlined like in the picture on the left, edges rounder than on the older versions. * SNCF: the coaching is double decked (the TGV-POS's are at first sight quite similar, only obvious difference being the single story coaches). * Thalys: Single story trailers. The TGV-POS was a necessary addition and the next step forward in the development of these highly successful super high speed TGV-series. The POS version added among other things an improved AC traction motors and the maximum normal operational speed was now raised to 320 km/h on the LGV towards the Germany. Technical details to be added, the ones below are mainly from the older TGV-Duplex. While many details have remained the same, there are differences as well. Painted silver and, with a narrow blue stripe. The engine is streamlined like in the picture on the left, edges rounder than on the older versions. the trailers are single story. The brand new TGV-POS units number 4407 and 4419 pose the camera in Paris Gare de l'Est. Picture above by Sanna Siissalo 2008. TGV-POS units in between their assignments at Gare de l'Est in Paris of units 4413 and 4416. Picture by Robert Forsstrom 2009. To be continued soon...he TGV-POS was a necessary addition and the next step forward in the development of these highly successful super high speed TGV-series. The POS version added among other things an improved AC traction motors and the maximum normal operational speed was now raised to 320 km/h on the LGV towards the Germany. Picture of the Alstom AGV in early tests at Velim larger test rink. Picture by Miroslav Broz 2008, provided under Creative Commons Licence. The AGV is the newest super high speed development model by the TGV builder Alstom. The train itself looks very much like the 10 year old ICE3 / Velaro and the idealogy behind it would appear to be at first look the same: saving the space of a locomotive (which is at the both ends of the TGV train) adds up revenue seats by almost a hundred! A notice the train operators can't ignore. However, the double decked TGV duplex is as well quite efficient revenue magnet, wioth proven technology the AGV can not provide for a few years. So maybe the real reason to design the AGV was after all the need to compete with now relatively successfull Velaro family of Siemens (which has claimed both Spanish and Russian markets plus some 60 unit built in for the Chinese super high speed networks). The AGV is actually slightly more advanced than the Velaro: The AGV has articulated bogies, a feature which both adds to the lightness of the design and makes the structure safer. TGVs articulated structure is notorious for its good behavior when accidents (very rarely) occur. While nonarticulated structure structure might zip zag in case of an accident, the articulated cars are said to stay well lined up even off rails. The AGVs maximum speed is 360 km/h, the same as Velaro family today. Alstom has also announced the lead customer for the new train design: NTV (Nuovo Trasporto Viaggiatori) has ordered 25 (+10 options) AGVs to be delivered from the year 2010 onwards. NTV AGVs will be taken into use in the Italian growing super high speed network. In the near future, Italy will also be connected through Switzerlands mountain high speed tunnels with the super fast networks of the France, Germany and a little further to the Netherlands, Belgium, Luxembourg, Great Britain and even Spain, a truly international European network of super high speed lines! -> Number of units: (25 (+10 options)), to be serviced by Alstom for 30 years. -> Configuration: flexible, 7 - 14 cars, the AGV design basic unit has 3 units + 4 bogies, and these can be coupled together with intermediate car. The configurations thus are: 7 units (3+i+3), 11 units (3+i+3+i+3) and interestingly 14 units (3+1+6+i+3). -> (to be) Owned and operated by: NTV (Nuovo Trasporto Viaggiatori, Italy) 11 car versions. SNCF, Renfe and Eurostar likely to follow soon. -> Bogie motor type: permanent magnet motors with power feed back capability (new motor type to be used). Each 3 car unit has outermost bogies powered. -> IGBT traction converters next to the powered bogies. Only a prototype available, we will add pictures later. NTV AGV specifics: 25 firm orders for period starting in 2010, + 10 options. These units are 11 module versions, and will include the contract for Alstom for 30 year servicing for the trains. According to sources at TR Europe the coaches will be painted (surprisingly) "Ferrari red". The trains will have two classes, with the "top class" with reclinig leather seats, TV-screens and internet access, stereo and minibar. Sounds like these trains will have similar services that the airliners first class might have today. - Use of permanent magnet motors on AGV means lighter weight, and less energy consuption, less noise and vibration inside, less maintenance. - the double decked version of the AGV is to follow according to Francois Lacote, the director of the project. This will add capacity so that the AGV will be able to match the capacity transported by the double decked TGV's (TGV-Duplex, TGV-Hybrid and TGV-Dasy units).